HF: Thanks to IDJ for this advert from about 1955. 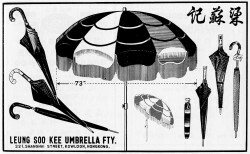 Leung So Kee ( 梁蘇記) has a long history of manufacturing and retailing umbrellas. The following information is mainly adapted from a computer translation on the company website with additional sources. There is no mention of whether any of the numerous shops were operating at the same time, though other sources state they were, when they closed or, of great interest to us, where the umbrellas were actually made. Can anyone provide any information about the company’s production of umbrellas, parasols etc? The first shop was opened in Guangzhou by Leung So in 1885. He later opened another there in 1920. Another branch opened in 1923, near Haystack Street, in Macau which apparently was the first to use machinery in the manufacturing process. The company moved to Hong Kong and opened a shop there in 1941 at 122 Des Voeux Road and in 1944 another branch opened at 321 Shanghai Street. It is difficult to imagine that during WW2 two shops would be operating so perhaps the one on Hong Kong island closed first. The advert above suggests that the Kowloon branch was still open in the mid-1950s. In 1949 a shop opened in Nelson Street, Mongkok. Between 1960 and 1991 a branch operated somewhere at Castle Peak Road [235? which is in Cheung Sha Wan]. At this time the third generation of the family were running the company. 1969 saw a return to Hong Kong island, this time to North Point. This outlet appears to have had an adjoining pawn shop, possibly directly connected to the umbrella shop, it was certainly possible during this period to pawn umbrellas. In 1971 yet another outlet opened at 580 Nathan Road, Yau Ma Tei followed in 1979 one close by at 537 Nathan Road. Between 1991-1994 the company was installed in Castle Peak Road [195?] and now involved the fourth generation of the family followed in 1994 to somewhere in West Kowloon. From 1996 to 2001 umbrellas where being sold at 97, Chung On Street, Tsuen Wan. Leung So Kee currently operates shops at the Shatin Centre, Shatin and the Dragon Centre, Sham Shui Po. For more information about the company see the conference paper “Case Studies of Hong Kong Business History: the Leung So Kee Umbrella Factory 1886-1986. This article was first posted on 8th June 2015. I was redirected to this article from “Pre-WW2 Industrialisation – products, when first manufactured and by whom” posted on May 20, 2014. Three sons of Leung So (founder) inherited the business, and each was given a “territory”. The 4th son’s shop is based in Macao, the fifth son’s in Kowloon and the New Territories, and the sixth son’s on Hong Kong Island. The fourth son might have inherited the original store in Canton also. I believe they were run as separate entities. In 1986, the owner of the Hong Kong Island stores, an engineer himself, decided to close the business on the 100th anniversary of Leung So Kee. Many (including myself) mistakenly believed that Leung So Kee was no more. It was only years later that I discovered the Leung So Kee name is alive and well in Kowloon and the New Territories. C This is very interesting, but complicated, so many sons! Leung So had six sons in total right? The first three sons inherited the business and each was given a “territory”. Do you you know where these territories were? Do you mean they had a shop which came with a territory? Sons 4, 5 + 6 didn’t inherit the business but had shops. #4 in Macao (and maybe Canton). #5 in Kowloon. #6 on HK Island. That covers most of HK/Macao execept for the New Territories. What areas are left for sons 1,2 +3? Or were they in China? Hope you can clarify this. Thanks. However, in the line for the 2nd store in Macao and beside the phrase 4th son, “eldest son” appears in parentheses. So perhaps the first three sons died young, or the first three children were daughters. It is ambiguous as some Chinese families have separate birth orders for sons and daughters, whereas in other families, there is only one birth order. I am trying to connect with one of the Leung’s family members, Peter Leung. Peter and I were roommates while attending University of Hawaii in Mid-Seventy. He left for Buffalo US pursuing Advanced Degree in Chemistry. We lost contact since then. Much appreciated for any help information. According to the Leung So Kee web site (currently down) archived from 2013 (https://web.archive.org/web/20130918201647/http://www.leungsokee.com.hk/history.txt), the Hong Kong Island store (122 Des Voeux Road, listed as the third branch) was opened in 1941 and the Kowloon store (321 Shanghai Street, listed as the fourth branch) in 1944. They were listed after the main store (Guangzhou, 1885-1925), first branch (Guangzhou, opened in 1920) and second branch (Macao, opened in 1923). An advertisement on the first page of the 28th July 1938 issue of The Tien Kwong Morning News (天光報) announced the opening of a sixth branch of Leung So Kee Umbrella and Toothbrush. The address was 78 Wan Chai Road. On the same advertisement, the addresses of two other branches were listed: 122 Des Voeux Road and 321 Shanghai Street. We now know that Hong Kong branches opened earlier than stated on the company web site.